See what I did there? I titled this post 'Changing Tombs' with a nod in the direction of the interior design programme 'Changing Rooms'. You may or may not remember this tv programme, where celebrity 'fop' Laurence Llewellyn-Bowen minced about in his lacy-sleeved shirts, flicking back his long flowing locks, and redecorating people's living rooms with red walls and zebra print sofas so they could come back in and break down and cry on camera because he had made such a hideous mess of their living room! So the announcement was made last week about the suggested design for the new tomb of Richard III in Leicester Cathedral. Thankfully not designed by Laurence (Phew! ), but seemingly creating just as much controversy as his exclusive 'designer' interiors on Changing Rooms. Personally I kind of like it, although at the risk of sounding a little like Larry L-B, my biggest criticism is the clash of colours of the stone tomb with the black/white rose floor inlay. The surrounding floor pattern also doesn't really help. I do like the idea of some kind of white rose floor plinth, although the black edging with writing around reminds me a little of the American seal of office. 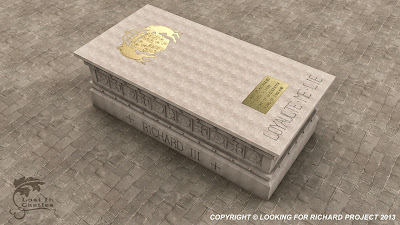 I am sure Richard, as a very pious man, would have approved of a cross on his tomb. Photo credit "Lost in Castles" "Copyright © Looking for Richard Project 2013". 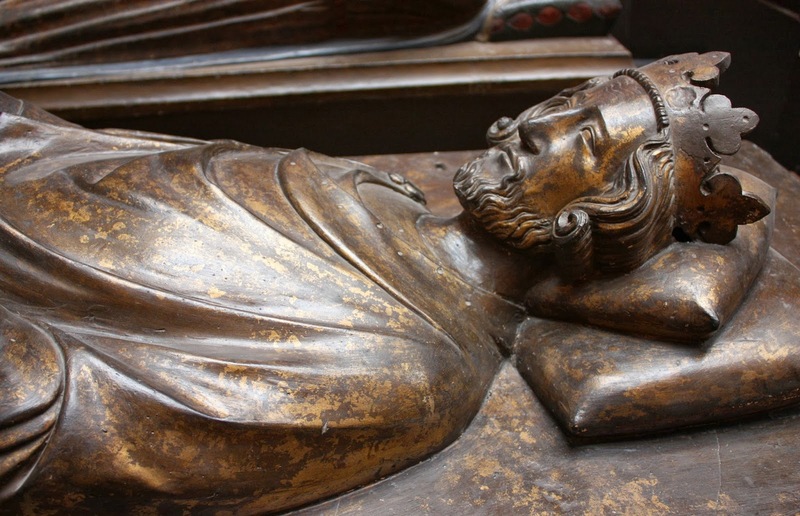 There are other people who would argue that Richard himself would have expected, and most likely wanted, an 'effigy' tomb, which was the designer tomb of choice in those days. Of course the truth is that, to our knowledge, Richard never made any decisions about his tomb, or indeed where he wanted to be buried (contrary to some recent opinions voiced on this subject). In fact, he rode out in his final cavalry charge knowing that, if he was not successful in killing Henry Tudor and thus ending the battle and challenge to his throne, he was likely to be killed himself. He would have known that he would then be at the mercy of Henry to bury him where he felt fit - which as it happened was the Greyfriars Friary in Leicester. As a very brave and loyal warrior king, I am sure Richard would have been just as proud to have been buried right there with his men on the battlefield of Bosworth. 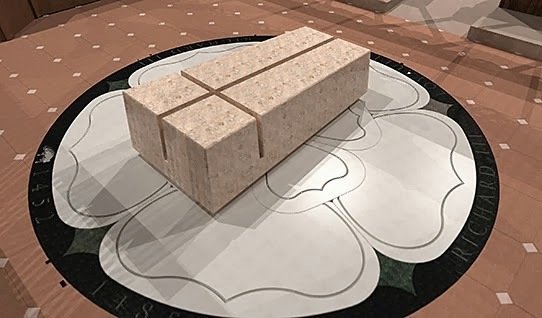 In the end, I am sure whatever design is finally chosen it will look suitably impressive in Leicester Cathedral, hopefully where Richard III will be laid to rest, just a matter of yards from his original medieval grave site. The Cathedral have already gone to great expense and disruption to provide a beautiful and fitting space in the Chancel, almost exactly where the Richard III commemorative ledger stone lays now, and Richard will be afforded a magnificent, dignified, religious reinterment ceremony befitting a former King of England, and then left finally to rest in peace. Surely we can all agree about that? Great blog Serpie, as usual. You have explained everything beautifully. Thank you, as always it is only my opinion. Another fine blog. Personally, I think the tomb design strikes an excellent balance between the competing factors of tradition and modernity. I can't want to visit it. Yes, I am sure it will look amazing, photos in the planning stage never really do show the true potential. 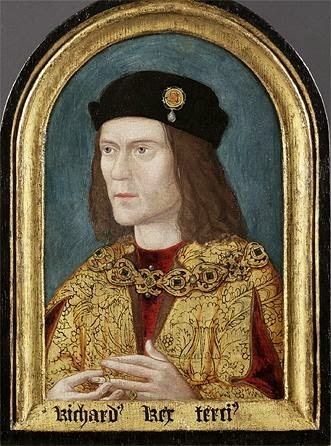 And I think what needs to be taken into consideration is that this is only a small Cathedral, and is also a place of worship within the community, it is not a shrine to Richard III. Obviously it will be the centre of attention, however the Cathedral must still function as just that. Thank you for your comments, as always much appreciated. Hello Serpie. My Twitter account is still down. Can you please tweet the two new posts on my blog.